If the old saying that "the clothes make the man" applies to iPads then a few dozen of the Apple tablets are on their way to setting up America's next biggest Ponzi scheme. 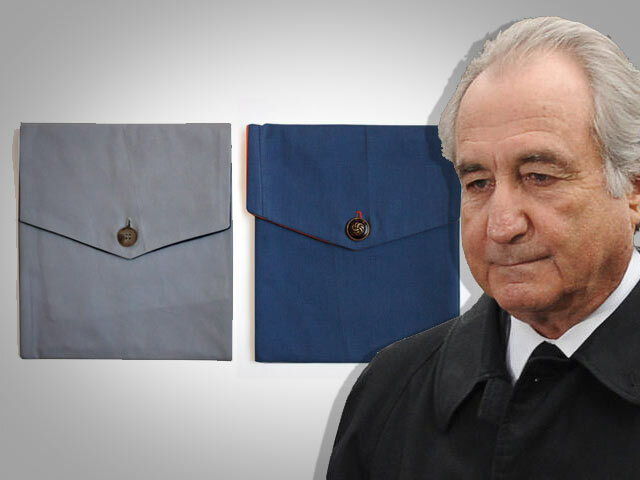 The New York Post reported Wednesday that items from disgraced financier Bernard Madoff's wardrobe are being refashioned into fashionable covers for Apple users who want to dress their tablets to impress. "People want these because he's somebody who did something bad," entrepreneur John Vaccaro told the tabloid. "Given the economic situation of the past week, I think there's an interest in the financial sector in Madoff that there might not be for other celebrities." Vaccaro bought some of Madoff's slacks and sweaters at auction in November for his Frederick James company, which makes luxury iPad covers that don't protect the tablets from being damaged if they're dropped. The first five Madoff covers came from a Christian Dior sweater and a cardigan from Bergdorf Goodman and went to a Wall Street lawyer for $500 each, Vaccaro told the Post. Covers for sale on Frederick James' website include one in blue made from a pair of Madoff's Polo Ralph Lauren chinos for $350. Thriftier shoppers can unslip their iPads from a repurposed section of his Banana Republic Gavin khakis. For $250. Vaccaro told the Post that 31 Madoff covers have been made so far. He expects to cut a total of 64 covers from the pants alone. (Four covers from each of the 16 pairs of pants he won at auction.) The cashmere sweaters produce three covers each, and Vaccaro said he's running low on material.